Briggs was having a bad day at the office this afternoon during scrimmage. I was happy with the way he started. Energetic for once, he was not only fulfilling his offensive duties out wide on the wings, he was also tracking back to help defend when we did not have the ball. Moreover, he was cutting inside into goalscoring positions, serving as the catalyst for positional rotation that is so difficult to implement when players are not on the same wavelength. 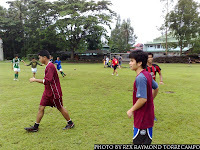 Because Yazzie, Chupek, Cocoy and Daren were intelligent enough to cover spaces vacated when Briggs left the wings, the positional interchanges were really quite attractive to watch. “You should find somewhere to plug into,” I advised while scrimmage was still going on. So I had to get up to do a pantomime of a robot turning this way and that in an attempt to fill its databases with information. 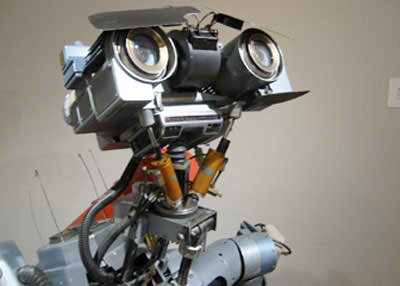 “Input, I need input!” I broke the pantomime as I did my own take on Number Johnny 5. What I wanted to point out to Briggs was that Number Johnny 5 was programmed to gather information upon which its “decisions” would be based. No different, I was quick to point out, from what is expected from a football player. And that was exactly the problem with the way Briggs was playing today, I pointed out. When he got the ball, his eyes were on the ground focused on the ball instead of gathering all the information around him: position of defenders, position of teammates, gaps between defenders, movements of players… All vital information upon which split-second decisions could be based to turn the outcomes of matches. 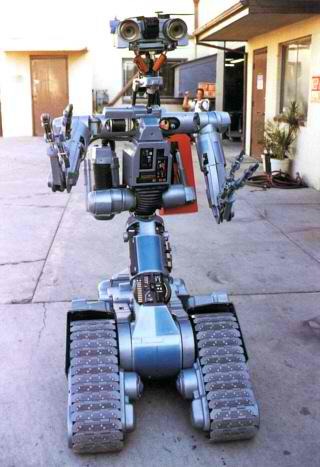 He could have taken a tip or two from Number Johnny 5… Shocking that nobody knows anything about the movie!